We've gone from 15mm-40mm, 90% chance of rain a few days ago to 3mm-8mm, 80% chance of rain. Like I suspected, lucky to wet the washing & its the 10% that will stuff it up. Think the troughs are the seasonal thing but the warm humid airmass streaming in from the CS this time of year is unseasonable. Thanks for the explanations. I just think that term unseasonal is greatly overused. Well, on the sunny coast for a break and have woken to steady down pour. Missus says "NOT HAPPY JAN". Like everybody out here nervously waiting for this event but the new, news story on Weatherzone about this event just caught my eye. I really wonder about the term "unseasonal". It seems every type of weather now is unseasonal. To me, this is a classic, normal winter type rain event. The number of years where these type of setups have given the best rain of the year in late autumn and winter are numerous. 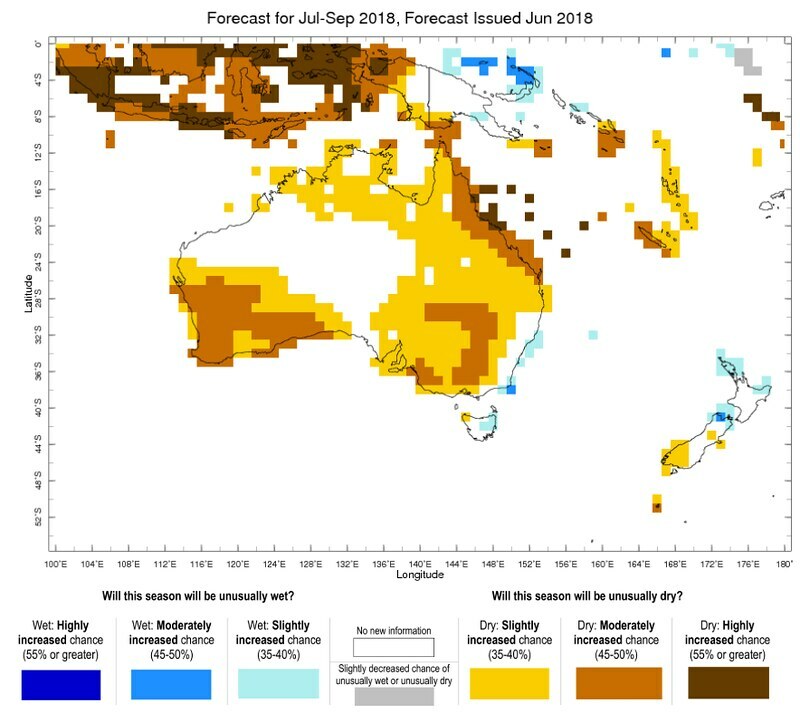 They probably mean that troughs in inland QLD are more prevalent in the summer months compared to winter. There wouldn't be much heating with the sun low in the sky compared to summer, so I am curious what is triggering this trough to form in the first place? I guess it depends on exactly what your own definition or criteria of “unseasonal” is. On one hand, it’s not usually a weekly occurrence but on the other, these kinds of systems coupled with a temporary moist onshore flow producing some rainfall in winter aren’t that rare either. The airmass to its east is mild but isn’t exactly what I’d call an exceptionally warm airmass. As for the cause of the surface feature, an upper trough or low often induces a surface feature which is the case in this setup as well. Thanks, Ken. I suppose the correct answer is the middle ground. LAST 24 HOUR WHR SUMMARY...No significant weather. A few (but not all) models are still trying to develop another surface system over inland eastern Australia next week in response to an upper trough. But you wouldn't want its associated dynamics to shift any further south than in current runs or we'll miss out on the better rainfall amounts again. That WATL map is disgusting compared to a few days ago. The only model that looked accurate is AccessG and it doesnt hold much hope for the next upper trough either. That map looks bad for Indonesian fires it they are still lighting them . Is this map on drugs? That first map also includes the 2nd potential system early next week. GFS has been very aggressive with the rainfall totals though compared to many other models. Models are playing with a possible significant rain event next week. Only early days though. They did with this one as well Mega, went from 90% something & poss 15 to 40 to a wet dishcloth. 50kt W'lys at 500hpa should be descent enough shear? With a weak onshore flow even convergence SE'ly turning ENE'ly 5-15kt in the low levels. Still GFS showing good turning with height. The lifted index on the the other hand.. might make things look alot slower in devoloping or more stable? Hoping there will be some lift but it does seem like the start of a series of upper level disturbances. The sad thing is desperate farmers planted on this weeks prediction and now its disappeared again. If this next one comes through it will help them a lot! ACCESS-G had a significant ECL sitting near the coast though which doesn’t look like eventuating. 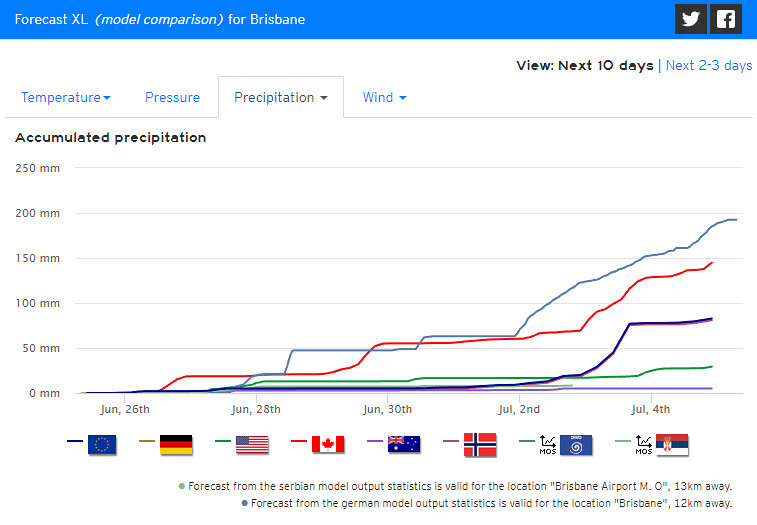 International models are mostly all interested in some worthwhile rainfall for southern Qld but ACCESS model seems not very interested. Does ACCESS persistently have trouble with forecasting rain over land in these types of setups? With the rain that has occurred off shore over the last few days, differences between Stapylton and Gympie radar rain 'estimated' 24 hr accumulations (rainfields product) can be seen. The 24 hr total to 9am 25/6 shows that in the radar overlap area off shore between Maroochydore and Cape Moreton, Stapylton showing a larger area of green (>25mm) and yellow (>50mm) than Gympie Radar. Appears that accumulated rain is not calibrated the same between these two radars. Note though that area of rain mentioned above is around 105km distance from the Stapylton radar and 125 km distance from the Gympie Radar. I have seen such differences before, but it appears to be more noticeable in the recent period with rain off shore. Interesting that next weeks rain event will be a "warm" rain. Dew points of 17C for Brisbane. Generated in 0.051 seconds in which 0.037 seconds were spent on a total of 14 queries. Zlib compression disabled.